A virtual server is an emulated server running on very large, powerful and fast physical server chassis. The advantages are that the virtual server is not tied to the physical hardware should a failure occur or reconfiguration is needed. It is easy to move a virtual machine from one server chassis to another by simply shutting down, exporting, transferring over, importing, and starting back up. Virtual servers can easily have their memory or CPU resources altered as the client wishes. Simple, easy, reliable. 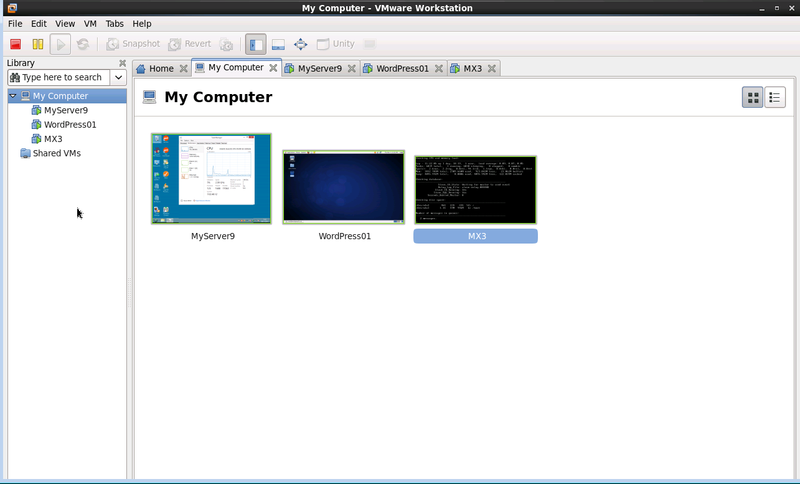 All of our virtual machines run on VMware (previously VirtualBox). We can create you an instance of a 64bit CentOS 6 LAMP (Linux Apache MySQL Perl/PHP) virtual machine for a one off setup fee of £49.50+VAT or import one of your own for free. All we need is the .ova file. All of our virtual machines come with a single static IP address, and basic support and advice. 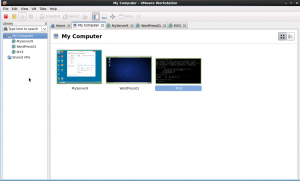 We provide you with your own root access for you to manage your own virtual machine via SSH or VNC remote desktop. Support is provided in office hours Monday to Friday. Out of hours, we have a dedicated support system that you will have access to. (1) An entry level Linux virtual machine with a single 3GHz processor and 4Gb of memory would be only £24+VAT per month and would make an ideal basic web hosting server. (2) A 2x 3GHz Linux virtual machine with 4Gb of memory would be only £36+VAT/month and would be ideal for e-commerce hosting. (3) A quad 3GHz Linux virtual machine with 8Gb of memory would be £120+VAT/month for high end work. Consider also our cluster facility. To calculate a price yourself, simply locate the column of the number of processors you wish to use, and then multiply the price by the amount of memory you intend to use, use the lowest memory figure that you will actually use. (1) An entry level Windows 2012 R2 64bit virtual machine with a single 3GHz processor and 4Gb of memory would be only £38+VAT per month and would make an ideal basic web hosting server. (2) A 2x 3GHz Windows 2012 R2 64bit virtual machine with 4Gb of memory would be only £78+VAT/month and would be ideal for e-commerce hosting.